September 12, 2014, Saitama, Japan – Tamron Co., Ltd. (President & CEO: Morio Ono), a leading manufacturer of precision optics, announces development of a new ultra-wideangle zoom lens for full-frame DSLR cameras with a fast F/2.8 aperture and VC (Vibration Compensation), the world’s first in its category. The price and launch date are to be determined. The lens will be showcased at the Tamron booth at Photokina 2014, September 16- 21, 2014 in Cologne, Germany (Photokina Booth Number:Hall 4.2 D10 – E19). Due to the large diameter and the prominent convex profile of the front element, it is not practical to deploy a protective filter. For the first time, a fluorine coating is applied to the front element, which repels water or any type of dirt, while making it easier to remove such smudge when contaminated. Speed of autofocus and control accuracy are further improved. USD (Ultrasonic Silent Drive) delivers tack-sharp images due to the high torque and fast response speed with least amount of lag time, yet with extremely low acoustic noise. Equipped with a full-time manual focus mechanism, fine focus adjustments are enabled without exiting from the AF mode. The SILKYPIX Developer Studio for Tamron provides a range of functions, in addition to the basic adjustment capabilities, such as correcting aberrations (lateral color, distortion, relative illumination fall-off) referring to the optical design data. Optimal use with Tamron’s SP series lenses – renowned for their high-depiction capabilities – delivers images that meet photographers’ most exacting demands. 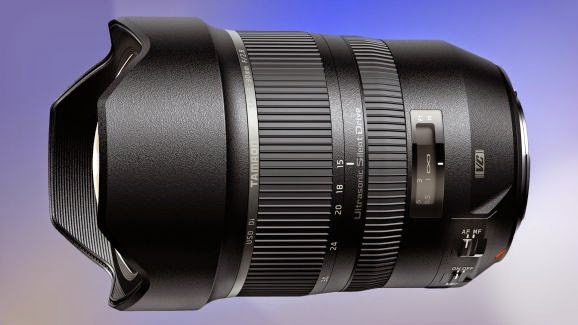 VC (Vibration Compensation) is Tamron’s proprietary image stabilization system. Tamron’s VC is a three-coil system, whereby three driving coils activate the shake-compensating VC lens group electromagnetically via three ceramic ball bearings. The VC lens elements are held in place only by contact with the ceramic ball bearings, achieving smooth movement with little friction. And since the VC mechanism is moved in parallel using only the motorized control, the mechanical structure has been simplified, enabling the development of a more compact lens. In the ultrasonic motor, a piezoelectric element arranged in a ring formation generates ultrasonic vibrations in a metallic ring stator, and the vibration energy is used to rotate a metallic ring rotor that is attached to the stator. The rotation energy is in turn transferred from the metallic ring rotor to operate the focusing mechanism of the lens. eBAND Coating, developed by Tamron, is a new coating technique that radically improves anti-reflection properties. A nano-structured layer (1nm = 1/1,000,000mm), with dimensions smaller than the wavelengths of visible rays of light, is deployed on top of multiple coating layers to maximize efficiency. Reflections occur at the interface between the lens and the air because of the difference in refractive indices of the two substances. The nano-structure of the eBAND Coating renders an extremely low refractive index by minimizing the differential with that of air while actively inducing air to its own structure, thus significantly suppressing the extent and degree of reflections. In addition, a total anti-reflection efficiency at the lens surface is further improved by means of integrating the conventional coating technique based on an active utilization of the “interference of light” principle, attenuating an amount of reflections by overlaying reflected light on the coating front surface and that of the back side with its phase shifted, thus increasing the net transmissivity. As a hybrid technology between the newly developed nano-structured layer with an extremely low refractive index and conventional multiple-layer coatings, the eBAND Coating provides superb anti-reflection performance, delivering crisp, razor sharp images, and remarkably eliminating the flare and ghosting that can tangibly damage image quality.